Everyone, in some way or another, is connected to a group, association or community-based organization. Our interests, backgrounds, and other factors will naturally lead us to those affiliations that best serve our needs. Race, culture, and religious beliefs also play a role in identifying us as members of unique groups that we often come to trust —sometimes to our detriment. Affinity fraud is when one person gains the trust of others because they share the same religion, race, ethnicity, career or other social characteristic and then deceives them in some kind of financial transaction. 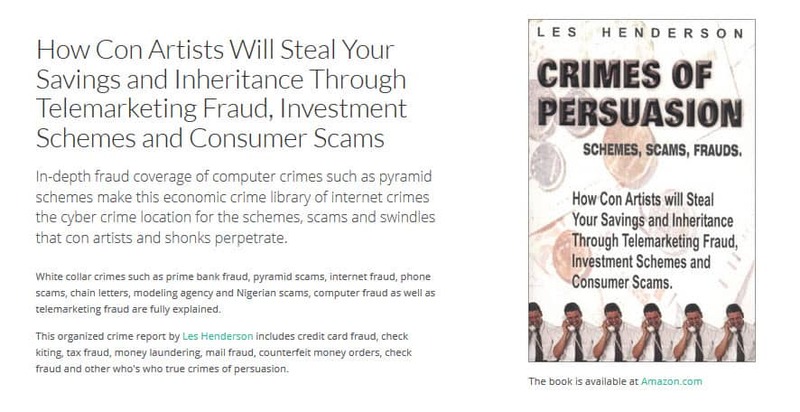 The deception may be intentional, as in the case of an investment scam infiltrator, but could just as easily be the result of an enthusiastic, but misguided, participant in a local gifting club or international pyramid scheme. In a world of increasing complexity, many people feel the need for a shorthand way of knowing who to trust. This is especially true when it comes to investing money. Unfamiliar with how our financial markets work, too many people don't know how to thoroughly research an investment and its salesperson. Affinity fraud poses a danger since it undercuts the usual warnings about investment schemes promoted by strangers. In these cases, the fraud may come to a your attention as the result of a contact from a friend, colleague or someone who inspires a bond of trust. "You can trust me," says the scammer, "because I'm like you. We share the same background and interests. And I can help you make money." The normal process of cautious skepticism is replaced by social banter. Another equally effective technique, if the con artist is not a member of the group, is to lull members into a misplaced trust by selling first to a few prominent members, then pitching the scam to the rest by using the names of those previously sold. The effect is the same. Once the connection to the group is understood, the natural skepticism of the individual member is overcome, and one more group name is added to the sales presentation. Because scam artists frequently pay out high returns to early investors using money from later arrivals the early investors may be wildly enthusiastic about a scheme that may be set to collapse entirely once you've invested. Once an affinity fraud victim realizes that he or she has been scammed, too often the response is not to notify the authorities but instead to try to solve problems within the group. This usually just ensures that the fraud continues without anyone reporting it to the authorities until it is too late to recover funds. Con artists recognize that the tight-knit structure of many groups makes it less likely that a scam will be detected by regulators and law enforcement officials, and that victims will be more forgiving of one of their own members. With immigration at levels not seen since early this century, many new arrivals to our country are seen by financial swindlers as ripe for the picking. Immigrant groups are particularly vulnerable to this type of fraud because they are sometimes isolated from the larger community and their flow of information may be limited because of language and other barriers. Some members of long-established minority groups have accumulated savings and achieved a certain standard of living through years of hard work. Often, they want to "give back to the community" in order to help others like themselves. However, such inclinations often make these group members sitting ducks for deceitful con artists who, despite sharing the same ethnicity or culture, are really motivated solely by greed. Swindlers who prey on minority groups will play the loyalty angle for all it's worth. Religious affinity fraud also continues to be a widespread problem. And swindlers who prey upon people of their own religion come in all denominations. Some elderly investors were duped into buying bogus promissory notes by three men, two insurance agents and an investment adviser, who often got on their knees and prayed with their victims to gain their trust. "I've known him all my life." "I trusted her as if she were a member of my family." "He was such a nice young man." "We had the same values and beliefs." The last of these statements was made by a complainant who had lost $100,000 by investing with a member of her church group who was going to produce a film supporting the political positions and beliefs of the group. The film was not made and the scammer disappeared. Many of the investors were fundamentalist Christians, including Mennonites in rural Pennsylvania, Ohio and Virginia. They were told their money would double in installment payments made over 17 months or less. Investors were quoted Luke 6:38: "Give, and it shall be given unto you." With such high yield returns, promoters will suggest that much of the bounty can be used by the investor to benefit the church or organization. Prime bank schemes will often attach a charitable aspect to them so as to offset any guilt resulting from suppressed greed. You should ignore claims that religiously-based investments are unregulated because virtually all investment opportunities, including church bonds, come under the scope of federal and state securities or commodities laws. Scams using religion as a lure to get people to invest money have taken in about $1.8 billion over the last three years, according to the Washington-based North American Securities Administrators Association. A former Sunday school teacher swindled at least thirty-three people, many of them church members, and like him, immigrants from India, out of more than $1 million. He got money from investors to supposedly buy nationally known stocks but then just stashed the cash in his personal bank and brokerage accounts. In California, commodity dealers targeted various Asian communities in the Los Angeles area. One company advertised in the "China Daily News" for executive positions at a new bank in Shanghai, China. Victims were told the company was looking for people without any experience in the banking business, so they could be trained from scratch. All fifteen people attending the subsequent seminar were originally from China. After three days of training, the marketing manager said that every person expecting to get a job from the "bank" in Shanghai had to put in practice what they had learned about foreign currency exchange transactions by putting up money as a test to see if they were qualified. The investments were touted as "no-risk" moneymaking opportunities and ranged from $15,000 to $300,000. The investors lost over 90% of their money in these foreign currency and precious metals investments —supposedly being made on their behalf on the Hong Kong exchange. One promoter targeted Christians by claiming he had built a device to find oil based on "visions" he had received from God. About 150 investors are believed to have lost more than $1 million in the oil and gas investment scheme. A former financial consultant who was charismatic and had "Christian values", was sentenced to 30 years for bilking thirty retirement-age investors out of nearly $6 million. At the sentencing hearing, he was greeted with jeers and boos as he tried to apologize to his victims. In Pennsylvania, several small Catholic churches were defrauded of about $1 million by an investment adviser-parishioner who had won the trust of parish priests. Unfortunately, there is no shortage of potential victims. Securities regulators point out that since many people feel like they've lost out on the historic bull market on Wall Street, they need to catch up. One affinity fraud which targeted members of Christian churches in rural Kansas, Nebraska and Missouri towns raised $7.4 million in funds from at least 125 investors, supposedly to trade in high-yield foreign bank instruments in a secret "prime bank" trading market. The promoters said investors would receive a monthly return of 20% for 12 to 18 months, and that the return of principal was fully guaranteed. To establish credibility within the church-minded communities, they gave the investments various names with Biblical connotations, such as Jubilee Trust Fund, Oracle Trust Fund and Elkosh Trust Fund. They also proclaimed their status as "born-again Christians" and suggested that the investment would fulfill a religious "duty" or "prophecy." They even informally enlisted members of various church communities to praise and promote the investment funds. Consequently, the churchgoers, most of whom were unsophisticated investors, invested in the trading programs based on trust and faith, rather than adequate information. The prime bank trading program did not actually exist and all funds have been transferred to several offshore entities. By making principal and interest payments to early investors, with funds raised from later investors, they gave the false illusion that the investment was successful. When confronted by authorities they attempted to persuade investors not to cooperate by referring to previously signed confidentiality agreements and by falsely telling them that cooperation with the government would forfeit any return on their investment. Through the use of church membership lists, a man in Utah preyed upon fellow members of the Assembly of God Church. Through his company, Making Good Choices Inc., he sold bogus "royalty interest" in such inventions as a "Mess Free Bird Feeder" and the "Vice Script" automobile theft-prevention engraving system. Victims were promised returns of "25% to 100% for years to come." In most cases, no products were ever sold and losses by church members were approximately $200,000. He, in turn, was sentenced to 15 years in the Utah State Prison. Not knowing what to do with the money, after receiving $300,000 from a life insurance policy on her husband, a 31-year-old mother of three in Scottsdale, Arizona, invested it with a Lay Minister in the Eagle's Nest Christian Embassy, where she was a member. "For the past year I have prayerfully sought the Lord for the plan and direction he would have us take in regards to the financing costs of the construction and improvements of the new building.… The plan and direction God has given us is strategic, sound and safe!..." Today, she and her family, as well as many other former Eagle's Nest parishioners, are still devastated after he pled guilty to operating a Ponzi scheme which took in $11.4 million. A Baptist minister from Texas is accused by the SEC of robbing $3.5 million from more than 150 investors in a religious affinity fraud scam in which he exclusively targeted African-American Baptists and promised them returns of between 7 and 30 percent. Ronald Randolph is accused of selling investment contracts for his fake plastics company, International Polymers Works which he claimed was profitable and had several contracts with major companies, including Exxon Mobil Corp., DuPont and Dow Chemical. He also said the investments were insured by Lloyds of London. There were in fact no contracts and no guarantees. To keep the ponzi scheme alive from 1997 through 2000 he used the money of new investors to pay back prior investors. 09/02 - Marcus D. Dukes, 33, and Teresa Hodge, 39, owners of Financial Warfare Club Inc. are accused of convincing black parishioners in 18 states to buy stock in nonpublic companies and to pay for investor education courses. The SEC said the pair used the money for other purposes and that none of the 1000 investors have made a return on their investments, which exceeded $1 million.. Going to churches from Maryland to Alabama they held presentations full of prayers and quotes from the Bible, selling their ideas by claiming blacks had been left out of the lucrative market for initial public offerings of stocks. They then offered parishioners unregistered securities, claiming they were investments that would help black-owned companies soon to go public through different entities, including Financial Warfare Inc., the Financial Warfare Club and Covenant EcoNet Inc. The pair offered three types of membership: "Founders" paid $2,500 and $50 a year for 2,000 shares of stock in one of three companies that were purportedly poised to launch IPOs; "warriors" paid $1,000 and $50 a year for 500 shares of stock in the three companies; "believers" paid $500 with an annual fee of $50. Financial Warfare Club's toll-free phone number greeted callers with: "We're excited that you are joining the war against financial apartheid and plan to ensure that we have the same economic and financial freedoms as every other American." The money collected was spent instead on other things, including $300,000 on salaries for Dukes and Hodge, $600,000 in transfers between the defendants, $42,000 in payments to hotels and more than $92,000 in cash withdrawals. Dukes, who was a stockbroker in the early 1990s, had been censured and fined $25,000 by the National Association of Securities Dealers, while Hodge had petitioned for bankruptcy relief four times between 1996 and 1999. In Alabama, nine people have been charged with cheating church members at the Daystar Assembly of God church out of more than $3 million by telling them the money would be used to buy retirement properties in Florida, the income of which would be used to pay off the mortgage of the Prattville church and build a religious theme park. The money went instead to pay off investors in a previous scam and to purchase equipment for unrelated businesses. Such appeals to race, religion or another commonality in selling fraudulent investments are referred to as affinity fraud. Such solicitations often try to equate faith in God with faith in the financial scheme.